Mum’s the word at Bellingrath Gardens and Home in November, when it’s time for the 55th Annual Fall Outdoor Cascading Chrysanthemums, the nation’s largest outdoor display of the signature blooms of the season. 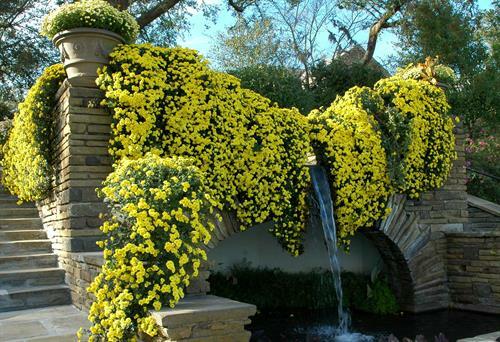 The Gardens and Home will be festooned with hundreds of colorful, four-foot-long cascades of chrysanthemums on bridges and balconies, as well as the traditional displays of mums in baskets and containers. Guests will also see columns of mums and bedded plants along the Great Lawn’s dramatic border in the rich fall colors of red, yellow, bronze, lavender and white. The Fall Outdoor Cascading Chrysanthemums show is the largest outdoor chrysanthemum display in the nation. The display is set out when the blooms are at their peak in the second and third weeks of November. The dates of the 2018 display are Nov. 3-21. Bellingrath’s Horticulture staff works nearly year-round on the cascading mums, which are meticulously cultivated in our greenhouses. The cascades are created when three plants are potted into five-gallon containers and then placed onto growing racks during the summer months. The mums are sheared every few weeks throughout the growing season in order to create fuller plants. For details on the Fall Outdoor Cascading Chrysanthemums display and for updates on peak bloom times, visit our website, bellingrath.org.